Land Auction: Indiana Hardwood Timberland – Woltz & Associates, Inc. HIGHLY PRODUCTIVE SOILS FOR QUALITY HARDWOOD GROWTH! These properties support mostly upland hardwoods such as white oak, red oak, sugar maple, black walnut, black cherry and yellow poplar with a significant volume of sawtimber. It is currently estimated that the Indiana tracts support approximately 28,000,000 Bd/Ft. of sawtimber. The timber has been well managed with an overall management goal of producing quality sawlogs. Timber harvesting has been performed for the most part by company crews employing a selective system of harvesting. Trees selected for removal included not only stems that have reached maturity, but also trees of poor quality and less desirable species, therefore, improving the overall quality of the growing stock. Access is generally good with many tracts having frontage on public roads. 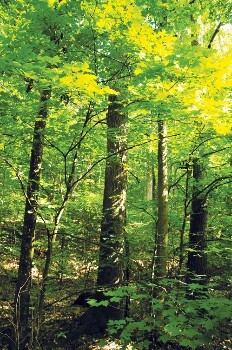 Several properties have shared boundaries with the Hoosier National Forest. TRACT 1: Orange Co. 140± Acres. High quality hardwoods ready for a second rotation select cut. Species include hard maple and white oak. Road frontage along CR 425N. TRACT 2: Orange Co. 273± Acres. Rolling topography made up mostly of quality mature hardwood stands with scattered pine mixed in. Potential building site with public water available. Unique subsurface Lost River on the property as well as a mixed hardwood stand including hard maple and white oak. TRACT 3: Orange Co. 270± Acres. Rolling woodland with frontage on hard surface CR 775N with a mixture of hardwoods and pines. Public water is available. A good potential development tract. There are field plantings from the 1990’s and mixed hardwoods including yellow poplar, white oak, and red oak. Excellent wildlife habitat. TRACTS 4-5: Orange Co. 114± Acres. Quality hardwood stands with road frontage on two sides. Just minutes from Paoli and SR 37. The property supports a mixed hardwood stand including yellow poplar. TRACTS 6-10: Orange Co. These tracts adjoin Hoosier National Forest and contain the following predominate species: white oak, red oak, and hard maple. Tracts 6-7: 435± Acres. Mostly hardwoods with white oaks having a high percentage of veneer class trees. Walnut plantations in the bottoms planted in the 1960’s and ready for select harvests in 20 years. Topography is rolling with Sulphur Creek running through it and several scenic rock bluffs. Excellent habitat for wildlife. Tracts border the Hoosier National Forest. Tracts 8-9: 125± Acres. Quality mature hardwood stands with good access and county road frontage. Tracts border the Hoosier National Forest. Tract 10: 88± Acres. Hardwood stand, selectively cut in 2001. This tract is surrounded by the Hoosier National Forest. Vehicle access has been granted temporarily and periodically on a private road through the Hoosier National Forest. Permanent vehicle access would need to be negotiated with the USFS. TRACTS 11-14: Martin Co. 195± Acres. 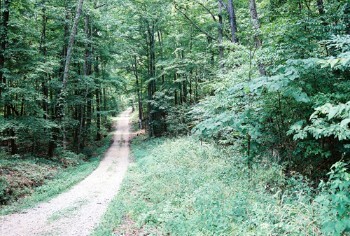 These tracts vary in size from 20 acres to 80 acres, quality hardwood stands with county road frontage. There are old field plantings of loblolly pine and yellow poplar from 1976 and mixed hardwoods of white oak, yellow poplar, northern red oak, black oak, and ash. These tracts border the Martin State Forest. TRACTS 15-22: Martin Co. 527± Acres. These tracts vary in size from 36 acres to 85 acres with frontage on US 50 & Sutton Rd. Public water is available along Sutton Rd. Imagine the possibities! These tracts include native hardwoods and field plantings of loblolly, virginia, and shortleaf pine. Dominate hardwood species include yellow poplar and black walnut. TRACT 23: Lawrence Co. 95± Acres. A secluded tract, all wooded with county road access. Adjoins the Martin State Forest. Dominant species include white oak and black oak. TRACTS 24-27: Martin Co. 292± Acres. Wooded with hardwoods and pines. White River frontage with a level to rolling topography and county road frontage. Tracts 24 and 25 contain a large 33 year old walnut plantation where over 20,000 walnut seedlings were planted in the mid 1970’s along with a native hardwood mix of predominantly white oak and red oak. Partial select harvest was done 5 years ago. Tracts 28-30: 143± Acres. A combination of cropland and hardwoods with predominate species of white oak, and red oak. Tracts range from 30 acres to 73 acres and have county road frontage. Tracts 31-45: 1,564± Acres. This contiguous property has tracts ranging in size from 14 acres to 295 acres with a combination of woods and tillable land. Public water is available! You will find some of the best wildlife habitat in southern Indiana, wetland area for waterfowl and level to rolling topography on this property. White oak, black oak, hard maple, and yellow poplar are found throughout these tracts. Good interior road network. Tract 35 includes the Mustering Elm Park with its free flowing springs! TRACTS 46-47: Martin Co. 135± Acres. Wooded tracts with easy access. Close to SR 450. This property joins the Martin State Forest. Selectively harvested two years ago. TRACT 48: Martin Co. 2± Acres. 4 platted lots adjacent to Indian Springs. Good elevation and road frontage on 3 sides. TRACTS 49-51: Martin Co. 231± Acres. A wooded tract adjoining Crane Naval Center to the north. Tract 51 has public water available along the county blacktop road. Good hunting tracts! There are stands of yellow poplar, hard maple, and hickory on the property. There is also a 35-year-old white pine planting. These tracts have been marked for a select harvest and are ready to cut. TRACTS 52-53: Martin Co. 76± Acres. Mixed hardwood property with frontage along County Farm Road and owned access to CR 126. Public water available! TRACTS 54-58: Martin Co. 988± Acres. Mixed hardwood property with frontage along SR 550 and public water available. Tracts from 52 acres to 360 acres. Great recreational tract with future development potential. Predominate species include: white oak, hickory, and yellow poplar. TRACT 59: Martin Co. 80± Acres. All wooded with hardwood and pine. Public water available. TRACTS 60-61: Martin Co. 157± Acres. Mixed hardwood property, fronting US 150. Great access to French Lick and West Baden Springs! Predominate species include: yellow poplar, black oak, and sycamore. A 30 year old black walnut plantation is along US 150 on tract 61. TRACTS 62-64: Martin Co. 320± Acres. 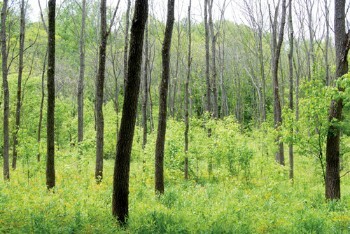 Wooded with some open areas – good for food plots. Access off of US 150 via an easement for Tract 62 and via county road (by church) to Tracts 63 and 64. Property includes hunting cabin and sawtimber size mixed hardwoods. HIGHLY PRODUCTIVE SOILS FOR QUALITY HIGHLY PRODUCTIVE SOILS FOR QUALITY HARDWOOD GROWTH! TRACTS 1-3: Dubois Co. 218± Acres. These tracts are only minutes outside of Jasper with frontage on paved Meridan Road neighboring Sultans Run Golf Course. Property has a long frontage on the Patoka River, and support both sawtimber size bottomland and upland hardwoods species, including ash, sweetgum, soft maple and yellow poplar. Besides the exceptional timber quality these tracts offer a great wildlife habitat! Excellent road network throughout. TRACTS 4-9: Martin Co. Tracts 4 – 8: 225± Acres. These tracts have road frontage on Burns Lane and support a substantial volume of black oak, red oak and white oak sawtimber. In addition, there are several wide flat old field ridges that support 15 year old planted virginia and white pine. This diverse forest type provides a good wildlife habitat. Tract 9: 82± Acres. This well managed tract was selectively harvested in 2005. It has road access off of CR 47. The predominant species is oak and hickory with area of regenerated yellow poplar. Rural water is available. TRACTS 10-15: Orange Co. 204± Acres. These exceptional tracts are only minutes from French Lick and all have frontage on paved county roads. 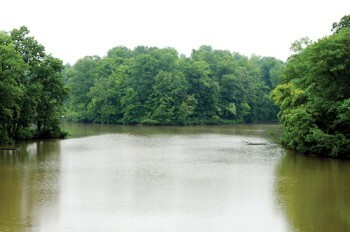 Tracts 10-13 have access to the Army Corp maintained watershed lake. A beautiful setting for recreation or a residence! These tracts support black oak, red oak and yellow poplar sawtimber. Rural water is available. TRACT 16: Dubois Co. 60± Acres. Conveniently located on SR 56 just west of French Lick, the tract was last harvested in 2001 and now supports a well managed stand of hard maple and yellow poplar. There is a small stream on the property, and rural water is available. Imagine the possibilities! TRACTS 17-18: Dubois Co. 75± Acres. These tracts have frontage on a county road and border the railway being renovated to access the French Lick Casino from the Jasper area. Dillon Creek runs through the bottom. The timber is well managed, having had an improvement cut in 2006 and now support hard maple, and yellow poplar. An excellent property! TRACTS 19-20: Orange Co. 170± Acres. These tracts are each easily accessed from paved county roads with new stone on the access into Tract 19. Abundant wildlife can be found due to the diversity of the habitat in the area. Tract 19 was last harvested in 1994 and now supports quality sawtimber with the dominant species being yellow poplar, white oak and red oak. Tract 20 had an improvement cut in 2005 and now supports white oak, chinquapin oak, black oak and sugar maple. Rural water is available on Tract 20. TRACTS 21-22: Orange Co. 285± Acres. These great tracts join the Hoosier National Forest. Tract 21 has access from a paved county road. Tract 22 is a swing tract and must be combined with Tract 21 unless purchased by an adjoining neighbor. An improvement cut was applied to these tracts in 1999. They now support a significant volume of sawtimber with the dominant species being black oak, red oak and white oak. There are a few old fields that were planted to pine prior to the 1950s. Rural water is available. TRACTS 23-27: Orange Co. 309± Acres. These very desirable tracts are located just outside of the village of Valeene, all with frontage on paved county roads. 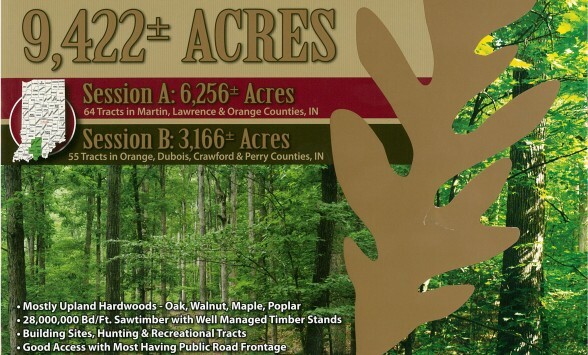 Tract 27 joins the Hoosier National Forest and has a mature high quality stand of hardwoods. It also has frontage on the Patoka River. Tract 26 supports a significant volume of sawtimber made up of black oak, white oak and yellow poplar. Tracts 23-25 support predominant stands of white pine and red pine that were planted in the early 60s following the abandonment of agricultural fields that used to grow broom straw. A great opportunity to buy at auction! TRACTS 28-30: Orange Co. 214± Acres. These are exceptional tracts with each having frontage on the beautiful Patoka River. Tracts 28 and 29 support walnut plantations which were established in the early 1970s. Tract 30 supports predominantly black oak, white oak, hickory and yellow poplar with the last silvicultural operation being carried out in 2002. A fresh water spring flows from the hillside on tract 30. TRACTS 31-32: Orange Co. 150± Acres. These great hunting tracts are easily accessed off of a county maintained road. The predominant species on these tracts include: black oak, white oak and hickory. It was harvested in 1993 by the previous landowner. A small stream borders Tract 31. TRACT 33: Crawford Co. 173± Acres. This large tract offers timber value and exceptional hunting potential. The last silvicultural activity was carried out in 1991 leaving a stand of sawtimber dominated by yellow poplar, hard maple and black oak. There are areas of old field plantations of white pine. The property is easily accessed from paved county road frontage. A great location near Patoka Lake! Rural water is available. TRACTS 34-36: Crawford Co. 190± Acres. These are great investment tracts located just off of SR 64. There is timber value and great hunting potential. These tracts had an improvement cut in 2006 and now support a well managed stand of white oak, black oak, red oak and hickory. Tract 34 and 36 join the Hoosier National Forest. TRACTS 37-51: Dubois Co. 610± Acres. This property includes a great mix of tillable and timberland containing pine plantations and mixed hardwoods. Tract 37 includes an old field plantation of loblolly and white pine along with a nice pond. Agland buyers should consider combining Tracts 38-40, 47, 59 & 50 for approx. 112 acres tillable. There is an old homestead and barn on Tract 40, a horsebarn on Tract 45 as well as a barn on Tract 50. There is great paved road frontage on Mentor Rd and rural water. Tract 43 contains black and white oak with some sawtimber volume. Tracts 44, 49, & 51 adjoin the Ferdinand State Forest. This property has something for everyone. Rural water is available along Mentor Rd. TRACTS 52-55: Perry County 200± Acre. 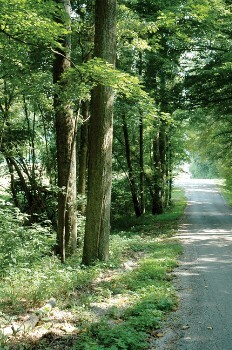 These tracts are located just north of I-64 and are easily accessed off of a county maintained road. The last silvicultural activity on these tracts was in 2000. They now support sawtimber size hardwoods with the predominant species being red oak, white oak, and yellow poplar. There are also old field plantations of white pine that were established in 1966. Tract 52 borders a piece of the Ferdinand State Forest. 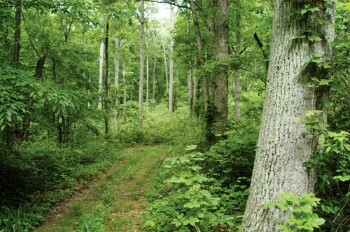 Tracts 1-10: Meade Co., KY – 2590± Acres which offer a great timber investment and hunting and recreational opportunity. Located near the Ohio River this well managed tract is very accessible with three public road access points and a system of interior roads. These tracts have a diverse wildlife and native plant composition. An area called the Lapland Barrens is a native glades area with a variety of wildflowers and native grasses which has been partially renovated by the cooperative effort of Kimball, the KY Fish & Wildlife and The Nature Conservancy. The barrens are home to a wide variety of butterflies and skippers managed and inventoried annually by The Kentucky Nature Preserves. The property has been well managed for the production of quality hardwood sawtimber with the major species being white oak, black oak and chestnut oak. Timber harvesting activities have been designed to selectively remove low quality species and stems favoring the better quality growing stock resulting in residual stands of quality sawtimber. The green shaded interior road will be a privately maintained road with a private road maintenance agreement unless all adjoining tracts are purchased in combination by one buyer. Tracts 11-14: Meade Co., KY – 437± Acres with excellent accessibility, tracts having frontage on paved county roads. These tracts were selectively harvested in 2006 and 2007. The residual growing stock is made up of sawtimber size white oak, yellow poplar, black oak and hard maple. 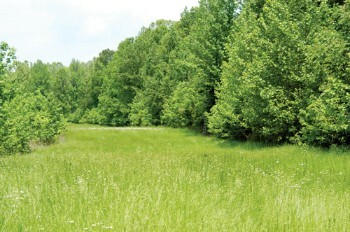 Tract 15: Breckinridge Co., KY – 111.5± Acre wooded property with frontage on SR 259 (Mooleyville-Ammons Rd). The predominant species include white oak and black oak. Timber harvesting activity was carried out in 1990. This tract borders the Yellow Bank State Forest. 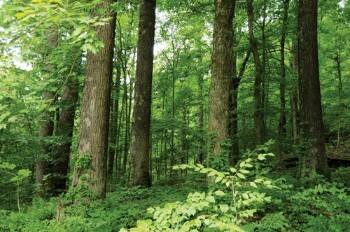 Tract 16-22: Breckinridge Co., KY – 1,117± Acre contiguous timberland property. Three access points off of county maintained roads provide good access into the tracts. Tracts 16, 17 and 20 have frontage on Town creek which provides water access to the Ohio River. Tract 16 has its own boat landing. The property offers a variety of timberland cover and wildlife habitat with major species composition being ash, white oak, yellow poplar and hard maple. Selective timber harvesting activities have taken place in 2001. (Tracts 17 & 21 will require easements over Tracts 16 & 20 respectively.) “Swing Tract” 22 must be bid on by an adjoining landowner or purchased in combination with Tracts 19 or 21. 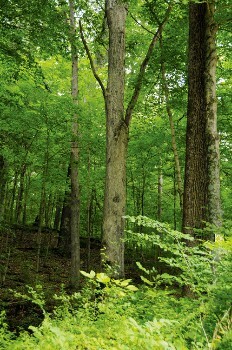 Tract 23: Breckinridge Co., KY – 80.4± Acre wooded tract which was last harvested in 2005. Select harvesting has been done to remove cedar and undesirable species. This tract has gently rolling terrain with good timber trails throughout. There is currently no legal access. Access has been across a short distance of the neighbor by verbal permission. Tract 24: Butler Co., KY – 1005.6± Acres which offers timber investment potential as well as hunting and recreational opportunities. Access is provided by frontage on Region Rd. A salvage harvest as a result of wind damage was carried out near the road frontage on a approximately 75 to 80 acres in 2005. Timber specie composition is stocked heavily with young white oak. Tracts 25-28: Perry Co., IN – 160± Acres located near the Ohio River are easily accessible with road frontage on a county maintained road. The dominant species are hard maple, red oak and yellow poplar. Small sawtimber make this a good potential timber investment. These tracts lie in the heart of the German Ridge Recreation Area of the Hoosier National Forest. 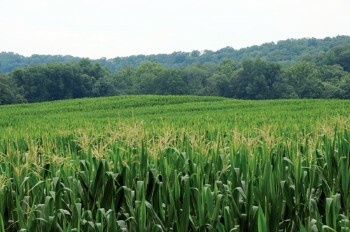 Tract 29: Harrison Co., IN – 200± Acres last harvested in 2004. The dominant species include ash, white oak, chinquapin oak and red oak. Little Mosquito Creek runs through the property. This tract has no current legal access. Access has been through the neighbor by verbal permission in exchange for hunting rights. This tract borders The Nature Conservancy’s Harrison County Glade Complex. There is an existing gas lease on this property with potential for gas royalties. Tract 30: Crawford Co., IN – 210± Acres with excellent timber and easy access to county maintained McClure Road. 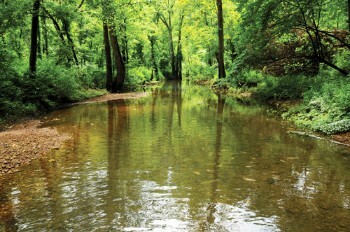 Turkey Fork Creek runs through the property. The tract supports sawtimber size timber with the predominant species being white oak, red oak, yellow poplar and black oak. There has been no timber harvesting activity on this tract since 1987. This tract has excellent recreational potential with food sources of nearby crop lands, composition is well stocked with mast producing species, and a running water source throughout. An extensive network of wood trails are maintained for easy access and viewing. Tract 31-33: Perry Co., IN – 80± Acres with good road frontage on paved county roads. These tracts offer potential building sites as well as timber investment. The timber type is mixed hardwoods including white oak, red oak, and black oak of small to medium sawtimber size. A selective harvest was carried out in 2006. Tract 34: Perry Co., IN – 40± Acres accessed from a 30ft. deeded right of way. The property supports predominantly a stand of mixed hardwoods consisting of white oak, black oak, red oak and yellow poplar. A selective harvest was carried out in 2008. All properties have been certified by The American Tree Farm System (ATFS). ATFS is committed to sustaining forests, watershed and healthy habitats through the power of private stewardship. ATFS has established standards and guidelines under which private forest owners develop a management plan based on strict environmental standards and pass an inspection every five years. Sale Held in Conjunction with Schrader Real Estate and Auction Co., Inc.